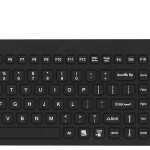 Your keyboard is designed to withstand repeated washings without needing to be unplugged or turning off the computer. 2. Clean the surface of the product by wiping, brushing or spraying it using only cloths, sponges or soft bristle brushes. 3. Wipe dry with cloth or allow to air dry. 4. After cleaning, press both Control Keys again for 3 seconds to unlock keys.
! DO NOT place the USB or PS/2 connector in fluid! 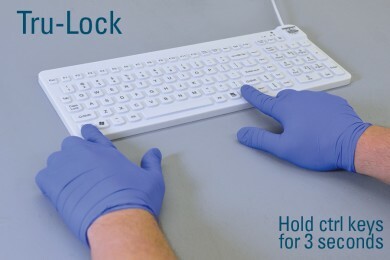 * Applicable to keyboards with Tru-Lock only. D Cool and L Cool have locking features with the FN buttons. Its Cool is not lockable. • Formaldehyde based - Formaldehyde Solution 37%, Vinco Formaldegen, etc. • Glutaraldehyde based - Aldacide 200, Lysofume, Wacicide, ect. • Phenol based - Cavicide, Isopropyl Alcohol, Medicide, Dürr FD 322, FD 333 & 350, etc. • Oxidizing - Hydrogen Peroxide 3% Solution, Lifeguard Series, etc. • Quaternary Ammonium - Roccal-D, Bacto-Sep, Parvosol, Dürr FD 300 2%, Dürr FD 312 2%, etc..
Man and Machine is more than just a leader in cleanable keyboards and mice. Our team of engineers bring a love of all things electronic.